(i) Distortion (coma) in the guide image. This is pretty severe and threatened to make reliable placement of a star on the slit quite hard. I found, however, that there was a 'sweet spot', horizontally around 20-25% of the way from one edge of the image, and about 10% down form the mid-line. This means the image of my slit is quite far over to the right. The problem seems robust to changes in guide cam focus and guide mirror adjustment (lateral movement). Even ayt this location the star images are not perfect but they are workable. I wonder if anyone else has seen this? Is it an issue taht is exacerbated by the use of a Ritchey Chretian scope (GSO style 10in)? (ii) Vertically wide spectrum image. I found this confusing at first... My spectrum image extended vertically over about 80 pixels or so and, over this range, there were vertical gradations in the intensity. I then recalled something in the instructions about setting the main miror to be offset so that 'vignetting' was avoided. I didnt understand what this meant (vignetting for me is a 2D gradation in a 'pretty picture' image rather than the pseudo-1D of a spectrum image) but it dawned on me that it could refer to my problem. I therefore set about moving the mirror over the small angular adjustment afforded by the oval cutout around the clamp screw on the base (It helps to loosen the other, pivot-end, screw as well - not in the instructions, but trial and error... :). This allowed me to have a narrow spectrum image with no gradation and I have now settled on this. The spectrum is not in the centre of the sensor, but I dont think this is critical... (?). What I think a vertically narrow image buys you is good calibration (?). (iii) Calibration at bluer end of the spectrum. If you step too far outside the comfort zone of Ha, then calibration can get tricky because the Neon lamp lines become sparser and weaker. I think I have managed to overcome this with extended exposure during calibration (30-60s) and I am very grateful to Robin's mapping of the neon spectrum on his web page - it's an invaluable reference! However, it strikes me that an auxiliary Argon lamp may help , but my internet search only showed lab equipment at around £400 - is there anything more mundane out there? (iv) Ritchey Chretien/spectroscopy combo. (Here's one for Andy...:). My Altair Astro RC is great for general imaging (beautifully flat fields etc, with little coma). However, the large central obstruction gives a bigger Airy pattern, with more energy in the surrounding rings than in the central disc (the 'soft focus' issue in imaging with RCs - there is no free lunch!). My star images overlap the slit extensively (I am using motorised focus with numerical analysis of the disc image, so I think its as good as it gets...) - but should I worry? In the Lhires exposure calculator spreadsheet availble online, the central obstruction factor doesn't make as much diference as I thought - so maybe not? I have also experimented with the optional 35mu slit. Its early days on this one, but this doesn't seem to give the 50% (35/23) improvement in signal I was expecting.. ? I know it downgrades resolution but at R =12000, I think you get most of what you want to see? Phew! Many thanks to those who read to the end - I look forward to your comments. I will reply to your points ii and iv, and perhaps a bit on i, as I think they may be related. I have the same setup as you, an LHIRES III and a GSO 10" RC. When I first started with my LHIRES III, I concentrated on trying to get perfect guide stars and a perfectly narrow spectrum. I was getting some very nice results. Then after a few months I tried tweaking things to get the maximum throughput. I found I was getting my best results by going for a compromise setup. By that I mean that the spectrum is not perfectly narrow, and neither is the guide image perfect. It is possibly I gave up too early, but from conversations with Shelyak and other users, I think the sweet spot is genuinely a compromise setup. My main learning was not to concentrate on getting the narrowest possible spectrum. I realised this when I started using MaximDL to examine spectra on the fly. Not looking to maximise the counts in the centre of the spectrum, or trying to get the narrowest possible spectrum, but instead to get the largest combined counts across the height of the spectrum. Hopefully you understand what I mean, which is basically you want as many photons to pass through the slit and spectrograph, reaching the detector. I found this might not be when the star appears perfectly focused on the slit, or the spectrum image as narrow as possible. This seemed a bit crazy at the time, and maybe I am still missing something, but I kind of assume it is something to do with the slit being a half-silvered glass plate. It is worth noting I don't mean a horrible guide image or spectrum, just not absolutely perfect. Here are a couple of images to try to illustrate what I mean. First an image of the spectrum of gamma Peg at high spectral resolution. You can see the image is not perfectly focused as the central obstruction shows in the middle. However, if I examine the vertical profile using a box area in MaximDL I see the following. So the dark centre is far from being black, but contains a lot of signal. I tried various ways to improve the look of the spectrum, to make it look more 'Gaussian' in cross-section and I did achieve this. However, when I did thorough checking of the results, I was always getting less photons. So when I focus, I aim to maximise the cross-sectional area of the spectrum, not the star on the slit. Just to be clear these are small changes, so the stars still look reasonable in the guide camera. To use this method of focusing (this is focusing the telescope), you need a star that is bright enough to give a decent spectrum in 10-20 seconds but not so bright that the spectrum starts to saturate. With shorter exposures you will be chasing seeing affects rather than true focus, and longer exposures will take a long time to try out different focus positions to reach the sweet spot. I find there is very little image shift in the GSO 10" RC unless the temperature really varies a lot during the night. So I can spend a decent time getting good focus, and then often leave it for weeks. With regard to the guide image, here is an example from my setup for comparison. I hope some of this helps. It would be interesting to hear if other LHIRES III users found similar results to me, or get their best results with the narrowest spectrum. Yes, your image of the spectrum looks like those I was getting before I adjusted the main mirror (i.e. a bimodal profile). I take your point about it being integrated flux rather than some peak value that is important. I will go back and have a look at that. If you look into the spectrograph with the imaging camera removed, you can see the diagonal mirror which sends the light towards the grating through the lens. It is important that the return beam misses this mirror when it returns to the camera. This is achieved by rotating the mirror. The mirror should be adjusted so the spectrum is approximately 1/3 the way up from the bottom of the camera field when the spectrum is horizontal and orientated with red on the right. The fact that the focus of the spectrum (The width of the spectrum line) is varying so much as you adjust the mirror. (80 pixels means the spectrum is way our of focus). I do not recall seeing this before This suggests to me something may be out of alignment. We may have to revisit this. Thanks for series of tips..! You will see I noted to Andy that the kind of spectrum I was getting was similar to the one he posted (bimodal cross section) so I'm not sure about the focus thing? I focus the collimator (terminology? i.e. the assembly behind the small door on the side) against the FWHM of the calibration lines. The bimodal feature appears to come and go as I move the main mirror about its fulcrum. However, I see you recommend placing it about 1/3 way *up* (with red on right). I have it about 1/3 way *down* so maybe I'll try swinging across the field of view (and taking some cross-sectional integrated flux measurements as I do so). So it does ! I need to recheck this then. (I was shown how to set it up this way at OHP workshop back in 2006.) The photos in the manual are rather confusing as they appear to show the spectra running vertically, displaced to the left. It also looks like the manual (on line at least) is well overdue for an update as it still shows the original kit built instrument with the adjustable slit and the old guider and calibration lamp setup. [For some reason my original 640x163 image has become vertically squashed, but I think you get the idea...]. Red is to the right. (i) The spectrum gets wider (more height in Y-axis) as it goes down the sensor. (iii) However, the spectrum is not so good in the larger-flux, lower-in-image version. In particular, it doest work well with the optimal binning option; there is a strong reduction of blue end amplitude. You can recover the blue end by unchecking 'optimal binning' (in ISIS) but - a) I don't think this is good practice (optimal means... optimal I guess?). b) there is some loss of resolution (narrow atmospheric lines are not quite as deep). Assuming some steady progression of behaviour from the version on the left (spectrum in top half) to that on the right, I think I will be aiming for something like the left hand image on my jpg below... Here its about 1/3 way down. It has the disadvantage that there are lots of lines which can be difficult to identify so I suggest sticking to the neon and H alpha initially while we get the spectrograph up and running. Hi Robin, Are those not the same as Relco 480s? That's what I'm using and their appear identical. Can you explain what you mean by 'vignetting' here? Do you mean the star disc spreads beyong the slit? For the stars I am looking at this is certainly the case. In this respect (star diameter vs slit width) my guide images look liek the one Andy posted above. Here I am talking about the light beam after the slit. It has to fit through the collimator in both directions. The collimator is f8 but there is an angle between the beam in each direction and the return beam is also dispersed by the grating so is wider. This means an f8 beam will overspill the collimator hence the f10 design specification for the LHIRES. Running at f8 does not affect the spectrum quality appreciably though, you just lose a bit of light. 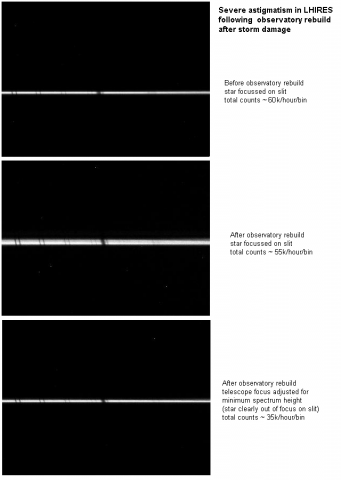 In spectrograph design there is a trade off between slit width, focal ratio and resolution. The upshot is though for a given resolution, the size of spectrograph optics scales with telescope aperture. >Do you mean the star disc spreads beyong the slit? For the stars I am looking at this is certainly the case. In this respect (star >diameter vs slit width) my guide images look liek the one Andy posted above. Images of the star on the slit can be deceiving if the star is over exposed as the overspill looks worse than it is. Best to measure the typical FWHM of the point spread function of the star when correctly exposed and in focus. Matching the slit width to this is a good compromise as most of the light will pass through the slit and you will optimise the resolution. With your setup 23um corresponds to 2.4 arcsec and 35um is 3.6 arcsec. I would not go any wider as you lose too much resolution. You cannot reduce the star size using a focal reducer either as that produces more vignetting in the spectrograph. When you do these sorts of calculations you begin to see how the telescope, local seeing and spectrograph design are intimately linked. The LHIRES is optimised for an 8 inch f10 with 2.5arcsec seeing. EDIT: Found the calculator I was looking for. For a gaussian shaped star profile, 76% of the light will pass through a FWHM wide slit. "Images of the star on the slit can be deceiving if the star is over exposed as the overspill looks worse than it is." With my 35mu slit, Isis reports a resolution of around 15K. This compares with the 23mu slit R of just over 17K - about a 10% loss. Inspection shows that the fine atmospheric lines are not quite as deep but I'm not worried about that..
OK as you have the latest version, you get the updated optics which should have improved the off axis coma. (I have not really used my LHIRES since I installed the upgrades but am just reinstalling it on the scope so should be able to report back in the next few days. The new design has removed most of the adjustment degrees of freedom of the guiding mirror (you can just push it in and out) so you are dependent on it being aligned correctly at the factory (with the old system you had full adjustability but was tricky to get spot on. I have kept the old adjustment system on mine) The sweet spot with round stars should line up with the slit but in this case being so far from the centre suggests an alignment problem somewhere. In the back of my mind I remember a similar comment from someone ese. You could check your guide camera is concentric with the guide port and square but beyond that I would be tempted to bounce that back to Francois at Shelyak and ask him to comment. Here is a post on spectro-l from Francois Cochard back in 2010 which helped me when setting up my guider. However, to correct it, I had to tilt the whole mirror assembly forward slightly which was effected using a washer on the top screw. I set up earlier but its clouded out here now so, unfortunately, I will have to wait for a proper field test. On the matter of the position of the main mirror: I carried out several experiments last night and hope to get back with proper analysis later...But preliminary thought are that the best throughput (total flux) appears to be with the spectrum in the lower half (as you suggested) but it does increase the height of the image. However I think this might not matter - some careful examination of results required. In any case, having explored the construction of the 'business end' more carefully, I have a better understanding of the light path. I think perhaps they should make you assemble them after all! I have asked for confirmation about the main mirror adjustment on the ARAS forum. The large change in width of the spectrum with the mirror position is strange. I am pretty sure I do not see this but I need a clear sky to check and the run of good weather has broken at this end of the country. A wide spectrum, even if it does not affect the total flux is not ideal as you have to sum more rows, introducing more noise from the camera and sky background. If the spectrum is wide when the star is focused on the slit (ie the flux is maximum), this can be due to astigmatism. ie the focus of the collimator lens in the dispersion direction (as set up by making the lamp lines sharp) is different to that in the vertical direction. (The spectrograph design has some inherent distortion of the image but this is small) . I had this issue once when I overtightened the grating in the holder, distorting it slightly into effectively a cylindrical lens. I am note sure how the gratings are supported in the latest design. A possible test for this could be to check the zero order image of a star without the slit in place. In this configuration the grating is effectively a mirror so the image should be round. I have not tried this though. When the grating was not pinched I did not see any significant difference in focus between the guider and the spectrum image. (ie when the star was in focus on the slit the spectrum was narrow.) This is true for both my ALPY and LHIRES. >A possible test for this could be to check the zero order image of a star without the slit in place. In this configuration the grating is effectively a mirror so the image should be round. I have not tried this though. Actually, checking back I see I did run this test. (though only after I had cured the astigmatism.) The test report is attached. And for comparison here is my spectrum image in the top half..
sorry - I am out of sequence with my replies - you note "A wide spectrum, even if it does not affect the total flux is not ideal as you have to sum more rows, introducing more noise from the camera and sky background." I think thats what I found (and optimal binning doesnt play nicely). It looks like you dont see the progressive vertical widening as you move the mirror (so the image goes down the sensor)? I think Andy saw this? >(i) The spectrum gets wider (more height in Y-axis) as it goes down the sensor. Yes to me this is unexpected but we need confirmation if it is normal. No clear skies here but I will dig out my artificial star or perhaps replace the slit for a hole and see what I get. I think we need to check this first before adjusting anything else. >By the way, do you know how Isis calculates R? It seems to do it from the image/spectrum and not from parameters as such. I recommend we clarify the widening with mirror position first before touching the grating. I think Robin has covered a lot of stuff really well. I will add a few more thoughts from my experience, taking Robin's lead by replying to all of the points in one post. >(ii) As well as this, the overall integrated flux gets bigger - an increase of around 50% from the two extremes explored here. I wonder if these are all related. As I understand it you are moving the spectrum down the slit, taking a series of images. I am not sure you would expect the same quality of spectrum near the top of the slit, in the middle, and at the bottom of the slit. I suspect, but could be wrong, that the narrow vertical height of the spectrum might be due to some of the light being cut off by either missing the mirror or otherwise not following a path that successfully reaches the sensor. Hence, you see more flux with a wider height, which does not look as good, because this is how the spectrum naturally looks when all the light successfully passes through the spectrograph. I remember looking at this with my Lhires III. I also experimented with different mirror positions and at first thought great I am getting a nice tight spectrum. Only later did I look at the throughput and then realise I was getting less photons. If you can get a nice spectrum in narrow vertical height with the same signal, then that is of course ideal. However, a spectrum spread in height of 10 or even 20 pixels is not necessarily a major problem. The geometric corrections should sort out the spectrum lines so they are nice and vertical, so you won't loose much in resolution when the signal from different rows is combined. Also spreading the signal over a few pixels can be a good thing as then you have not got the problem of a single bad pixel or cosmic ray hit ruining a region of the spectrum. Another way to investigate how the throughput changes with vertical position of the star on the slit is to take a sky spectrum at twilight, or possibly even daytime. It is like a flat, though not a flat you could use as it will be the solar spectrum. For this type of investigation the flat lamp may not be as good as it may not illuminate the slit evenly. The idea is by looking at the change in intensity with height, it will give you an idea of where to position your star for maximum throughput. Remembering the stellar spectrum does have vertical height, so this is not perfect, but it will give you a good feel for where maximum light passing through the slit to reach the CCD. Of course you can do this by positioning the star at different positions on the slit, but this gives a quick way to look at the whole slit. On another topic related topic. I always try to position the star at about the same position in vertical height on the spectrograph CCD, as this minimises differences between spectra. Even though a flat field should remove most variations, I do everything I can to make create a repeatable accurate spectrum. When carrying out response or flux calibration, this means the light from both the reference and target stars following the same path through the spectrograph, and illuminate the same CCD pixels. I found the grating holding was pinching my grating a little too tightly, and this was distorting the grating and so the spectrum. I loosed the holder, and then re-tightened it so the grating was held firmly in place. I saw a noticeable improvement in my spectrum, but it still had a vertical height of 10-20 pixels. I have converted over to the latest guider mirror setup and I made some tests today using the internal flat lamp and a pinhole in place of the slit (actually a piece of foil with a slit in it overlaid at right angles over the middle of the original slit.) This effectively simulates an on axis star in the spectrograph, though the effective focal ratio may not be correct. I did indeed find that the thickness of the spectrum increases when moving the spectrum from top1/3 to bottom1/3. In this case approximately doubling in width (FWHM) from ~ 50um to ~100um or 8-16 pixels (The actual size of the pinhole in this direction is no known as it was just scored in the foil) This seems less than you were quoting Kevin, though perhaps you have a larger sensor/smaller pixels ? I also made the same measurements on the zero order image with similar results, though the height of the zero order image was a bit less than that of the spectrum, (~2/3) possibly due to the anamorphic factor which makes the diffracted image narrower in the dispersion direction but wider at right angles to it. Is the star on the optical axis ? Andy's comments started me wondering about this. There are two ways to move the spectrum vertical position in the camera field. You can adjust the spectrograph mirror or you can move the star along the slit. You commented, Kevin that the slit position and the sweet spot did not correspond to the centre of the guider field. (They should do when everything is correct.) I wonder if because of this, where you are placing the star is off the spectrograph axis, exaggerating the widening effect in the spectrum. Andy said " As I understand it you are moving the spectrum down the slit,"
No - I am changing the angle of the main mirror using the set screw on the bottom. I try and use a central slit position at all times. As you swing the mirror back and forth, you get the images I showed. I took this opportunity to adjust the grating for uniform image placement over wavelength range. It wasnt bad before - a change of about 10% of vertical sensor size in going from Ha++ to zero-order image - but I got it down to 5%. They were tiny adjustments...To do this I used the Shelyak recommended hi-tech approach - piece of card with a gap in it, placed over the mirror slit - but it works for this. At the end, I just cinched the screws tight and didn't drive them all the way home. Robin noted that the total flux should stay constant. Logically it should, so let me explain what I am measuring. I am taking the final summed image from Isis, then just doing a windowed stats measuremnt of the spectrum image. But I think Andy also reported a change in total flux with this kind of manipulation...? I know that early versions had three degrees of freedom on the guide mirror (two tilt and back-and-forth). The reduction to one with the piston design has thrown some of the 'baby out with the bathwater' in my view..
Incidentally - adjusting the main mirror angle still has the same effect as described in this thread (move image across sensor and change its height) - my tweaking the grating has made no substantive difference. Maybe a face-to-face at the late September meeting if we are all going? > I know that early versions had three degrees of freedom on the guide mirror (two tilt and back-and-forth). The reduction to one with the piston design has thrown some of the 'baby out with the bathwater' in my view.. I am thinking that too. I can see why it was done as It was easy to get into a mess with the old tip/tilt setup but the new setup depends on that wall of the spectrograph being very accurately square which cannot be guaranteed with the type of case construction used. Having reviewed what I posted on that ARAS thread, I am not convinced my alignment is quite as good as originally. There is not enough room for the old mechanism now though with the the calibration lamp mechanism. What a great thread. Thanks for sharing Kevin. Good to hear you are making progress in the right direction. I misunderstood the way you were moving the spectrum. I too experimented with moving the mirror, though this was 2-3 years ago and I cannot remember all the details. I think I originally saw an improvement in the appearance / reduced height of the spectrum with the mirror at one extreme. I later realised I was getting less flux and so I think I was cutting off some of the light, or missing some of the light in that position. I will be at the Observers Workshop in September. I found that my Lhires III worked out of the box, other than initial setup like focusing and finding the micrometer setting to view the H-alpha line. It is a more complex instrument than an Alpy, so there are more things to adjust and it may not be the best place to start out in spectroscopy. I managed to get some decent results on my first night, helped by the fact that I had previously been using an L200 which has a lot of similarities with the Lhires III. I did see improvement from my first observations to later ones as I tweaked the setup and learned how to get the most out of the spectrograph. It is a continual journey, and I am sure in a few years I will be getting even better results. To show you what I mean, below are some observations from my first light with my Lhires III. First a spectrum profile of zeta Cas. Here is one of the spectrum images. Then about 18 months later here is a spectrum of chi Cyg. And the underlying combined spectrum images. Nice first nights spectra!. I realise these are complex instruments but with a new expensive instrument I would balk at having to “ tilt the whole mirror assembly forward slightly which was effected using a washer on the top screw “!. Just my twopennuth . I have spent a small fortune on my Lhires getting it upgraded and buying all 6 gratings. Now it suffers from light loss which I have been unable to solve as its enclosed in a film changing bag ! Bearing in mind other peoples issues, would it be possible for the BAA to organise a Lhires users weekend ? It would give users sufficient time to compare notes and maybe solve some issues. I hear what you are saying, as you should not need to introduce a washer to get a good image. It will be interesting to hear how Kevin gets on. I am a bit biaised as I started off with the cheaper L200 (by JTW) before upgrading to the Lhires III at about twice the price. These are both Littrow spectrographs with some similar design features. The quality of the guide image I was seeing through my Lhires, while not perfect, was far superior to my L200. Example L200 guide image with obvious flaring and triple image of the star. Example Lhires III guide image. Not perfect with a secondary image of the star, but overall better image quality. To put this in context for anyone following this thread, in spectroscopy the purpose of the guide image is to allow you to locate your target star, position it on the slit and to keep it there. So while a good quality makes this job easier it is not strictly speaking essential. The Lhires III and L200 have a series of mirrors and lenses to relay and focus the guide image to a camera, and these can introduce various image aberrations. For example I was able to get some excellent spectra out of my L200 even though the guide image was not very good. Sorry to hear you are having problems with your Lhires III. Do you mean light loss from the spectrograph, or light leakage into the spectrograph from outside? Will you be coming to the Observers' Workshop - Variable Stars, Photometry and Spectroscopy on 29th September? That is a good place to start as there may be other Lhires users present. I can try to find out if you are interested. I would not rule out an Lhires III weekend, but we would need enough interest to make it work, and people willing to organise it. Also a weekend event has much bigger costs due to the need for overnight accommodation. I have now used my Lhires with the 'engineered shim, guiding mod' (aka washer for tilting the mirror). My guide image looks a bit more like Andy's second image above - prior to that it looked a bit like the first... Its now much easier to guide. I use slit guiding in Prism. I can vouch for the light leakage problem (ingress not exit). This isnt a problem I guess, unless you try and do some of the daylight solar experiments they suggest (that's how I first discovered it). I have now used judicially applied electrical tape (reduced but not eliminated light entry entirley). There might be a problem if you had excessive glare from a laptop similar? I also managed to get something 'out of the box'. But I am finding going past the mag 4.5(ish) barrier is not trivial... The SNR goes down appreciably, but I am hoping the easier guiding will help here. I would also be up for a weekend on this topic. I will be at the meeting on 29th. I will be at the meeting on 29 Sep.